Loving what is on your desk, but especially what is on the ipad sling thing. Loving your 'scrappy' desk this week! Fabulous projects in progress - do you make books as Christmas presents? Just wondering if I should... Not sure how they'd be received by my non-crafty family!!! Happy Wednesday! Julia - I LOVE all of the stuff that's happening on YOUR desk today! The cards. The photos. And all of the DELIGHTFUL stuff! I feel like it's one of those "how many different things can YOU spot in the photo" puzzles! Happy WOYWW from (I believe) #6! Love your shadow photo in the middle, I've one myself just like that one. My poor ipad keeps getting tossed out of its chair harrrummppffff. Drunken card aye, would be something my husband created lol better go google this one too. Lots of useful crafty stuff on your desk, as usual. Sometimes you get the best result by just going with the flow. You couldn't plan it if you tried. Strange that. Gosh fabulous stuff going on there Julia, so many projects underway, loving the accordian album too, I've been thinking about making one of those but then I think about making lots of other things too and never seem to make much in the end - if all that makes sense? I'm not playing this week 'cause there's bugger all to show on my desk! I'll find something to show next week I promise! Hullo there Julia, It seems like yesterday we were here (instead of last week).. doesn't it? ah love the accordion photo album! Happy WOYWW hun, love the desk and especially the pink and black card...very stylish. Lots of creative mojo going on your desk, LOVE it!! Your desk looks fabulous...so full of interesting bits and bobs that i don't care about the dark thingy. The hot pink and black and jeweled card/book? on the chair...Is that the drunken card or the acordian fold? I love those colours! Hot pink and black and bling!!! I'd so take bad lighting, I've no way to post a picture!!! I'm beyond help, but the best thing is I'll have some time to do some visiting!! Happy WOYWW #16 off to dream about SPACE. Lovely busy desk there and I like your accordian book - I too am easily distracted (probably why I never get anything done! or if I do it takes me ages!). Have a fabulous week. ohooo afer seeing your desk today, I do so want to be home now making my desk messy instead of dealing with messy dogs! (They're lovely really...but its nice to know they have owners who are coming home soon!) I think my first task will to be to make something with ink, haven't stamped in ages. Happy WOYWW ((Lyn)) might be at #28...or by the time I type this 59! Goodness, is that a photo of Miss D in her PVS fleece?? A la Recherche de Temps Perdu...happy days and all that :) Hope the workshop stuff is progressing well! Thanks for sharing your desk - it's very inspirational. The unplanned cards usually turn out the best in my experience. christmas cards for me this week still have too many to make more to than done. Good monring and Happy Wednesday. A fab busy desk there as usual, Mrs D. Love the peaks at your cards. Love your accordian fold album Julia. How lovely to get inspiration and just go with it. ps really hope you don't mind us asking to be liked today...we need the numbers to get things moving. Love your mini albums and can't wait to see the current one you're working on! I wish I lived closer so I could go to your classes and learn lots and lots!!! I'm thinking of trying your accordion books at the craft club I run at a local day centre. I could do a Christmas themed one. Thanks for the idea. Lovely desk with work in progress...you have been busy creating those goodies sitting on the deckchair. I'm so glad that other folk find the light at this time of year a real pain too. Morning Julia and it is a lovely one here with shiny sun and no rain. 'Spontaneous and arty' is my aim as well but often more 'spontaneous and messy' on my desk. i like the look of your projects today. you seem to be getting a lot done. oh Julia, even if you only share about one photo of your desk every WOYWW post, you always manage to be so amusing!!! Your desk always has fun projects goin' on!!! Thank you for hosting this wonderful looky-loo!!!! Love your desk this week! So much going on there! Hope you have a wonderful rest of the week! Is that a Christmas Card I spy as well?? At least there is something happening on your Desk!! So, who do you give a drunken cards to? Most people get like that on a birthday or is there a special drunks day in England :) Nice to see you desk is looking like mine. This is my last WOYWW for 2012, so have a very merry Christmas and a happy New Year. See you in 2013. Sweet little brag books which I think will go down great at the workshop. I've been thinking of those poor people flooded out and trying to imagine how awful it must be for them. I have a cyber crafty friend who lives in Evesham and her basement is flooded. She assures me her craft stash is safe on the top floor! Mini albums are looking good, as is the card. Please don't spoil our illusion that you are all spontaneous and arty, it's a disguise we all like to wear!! joining you for the third time julia-somebody left me a comment to turn off word verification but can't see where to do this-can you help???? Lovely accordion fold album coming along there... and why not stop for a rest - a.k.a. make something else in the middle of it all?! Thank you for another lovely nosy Wednesday! Great accordion book Julia love your colour combo. Have a super Wednesday. Love the look of the brag book. The mini books are a great idea. We may have to add them to our ever growing to do list. Julia ,being creative is also being spontaneous...love your little brag book...desk looks pretty tidy for a busy lady!! Like an eager child I rush to the Stamping Ground to see what wonders my eyes will gaze upon in your delightful space! Oh that we all could be arty and spontaneous when creating! Back again after my PC died on me, will now have a snoop around the desks and see what you've all been doing. Love the brag books you've been making! I love the folding accordion album, what a great idea, your desk looks like a "happy mess" thats the best kind! Hot pink and black is always a great colour combo. Woo hoo! In at under the 100 mark today. Little things and all that! Three items in three days, I'm impressed, I can't manage one thing a week right now! I like the simplicity of the card too. I have family in Somerset so I've heard a lot, and seen a lot on the BBC website, about it all. Such a terrible shame, it's amazing how much water one little island can hold. Happy Wednesday! Looks like you have a lot of great stuff going on today! Spontaneous and arty. Love that! Sorry to hear about flooding over there. Wishing everyone affected in Great Britain well! Great desk, and yes, we do become very attached to all the friends we make on here, I agree. Still decorating! Definitely some creativity going on at your desk! And a "drunken card"? Sounds interesting. I've been looking at your past posts now that I'm home and am quite fascinated in your Stickles holder. What a cute album, I don't think I've ever seen one like that before... I'm digging your jar of buttons back there! Moved up again this week, #99! Lots of lovely loveliness to see on your desk. A drunken card? How did that happen? What a powerhouse you are Julia always creating. Accordion books are really fun to make and add to other books. Searched for the drunken card it must have fallen over! Thanks for this sight always makes Wednesday a look forward to day! this is my first time participating after seeing others post about it for a while. Thanks for hosting this fun weekly meme. Love the mess on your desk! I hope your day goes well and you finish up your samples for your class. Come play at my desk if you have time. If not, no problem. Love the cards and the accordion album. Cute. We are all sick here today. awful. But I hope you have a wonderful party today..
Julia, your accordian albums are looking good. Love the busy desk!!! Have a wonderful week. I used serendipitous in my post today : D. I am ridiculously easily amused lol. The thought of a drunken card is just so image evoking. The card is just gorgeous. Thoughts and prayers to those in need of them. I was #112 and now I have disappeared! I am going to re-link now. I hope it wasn't anything I did to get removed. I am combining WOYWW with a giveaway of the ornaments I have been making on my workdesk! Hope you come by for a chance to win 1 of 5! I spy lots going on today. I like the brag book. Lots of interesting viewing as usual!! Missed last week but nearly back to normal now!! Germany calling... I arrived safe after delay but happy to be with the family. I agree so much with your 1st paragraph... This idea of yours is also addictive but resulting special friends are a wonderful bonus. Family all tucked up but with the hour time difference I,m still up so playing catch up alone! aaaah! Love the busy action of your desk... Never a dull moment there! Love Jo or auf wiedershen if I could spell it. Can.t type without my proddy tool on this iPad and it has somehow gained predictive typing today! Loving the little accordian fold album. Lots of lovely bits to see on your desk, is that gold flakes in the little blue lid tub? really love the cards you have made and can't believe you can just whip a card up, I spend way too many hours overthinking them and end up with nothing lol, wish I could grab a stamp and make a card just like that. I am worried Julia. The "stamps reminded me they haven't been used in a while"!! Stamps talking to you these days? I haven't joined you this week but I will definitely be here next week on the First Day of December!!!! 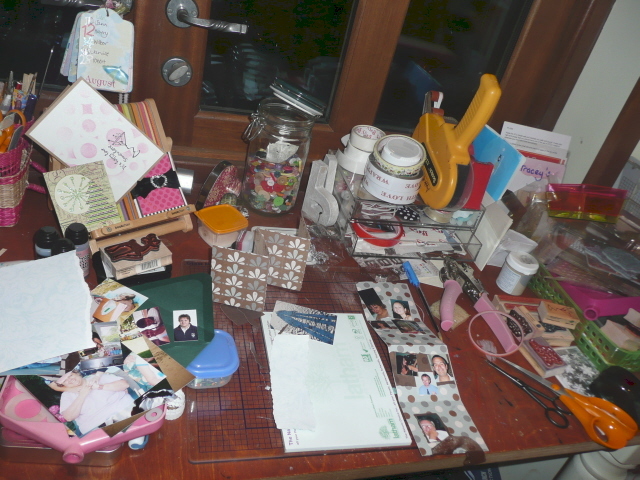 Maybe I will put my picture of my desk in my new Christmas Album which you saw in progress at The Crop!! Hello, Julia! *waving from Colorado* I didn't know about the flooding in Great Britain...prayers to those affected. Is that a birthday calendar hanging up in the corner of the picture? Love the button jar and the mini album. Cute! So glad to have time to post and most importantly visit! :) Happy WOYWW! I'm back finally! Did you miss me? LoL. But I did get my much promised Giveaway together - open to my followers worldwide. Please come to visit when you have a moment or 2! Can you believe that I've never done an accordion album? Looks easy enough to me, so why the heck didn't I do it? Thanks for the inspiration! Nice busy desk, Julia, and I love the pink and black card on the deck chair. Thanks for looking after us again! There's late and then there's just plain ridiculous! See you're speech is so true...I couldn't go past this week without posting...you've got me good! I've zoomed in just to make sure I don't miss anything on your desk. Oh my you are a busy bee ZZzzZZZzzz...! Just wondered why I always start off as one number and then when I go back my number has changed??? I'm not a pink girl, but the moment it's teamed with black I love it. Can we see more of your fab book? Gosh, i've had such a week this week that I still didn't have time to catch up with last weeks desks. Every normal little thing just feels like great big things to me. I still haven't created any Christmas cards still which is now frankly starting to worry me!